Whether they’re strangling your hydrangeas, prickling your feet, or just plain look ugly, weeds are the bane of every Aussie backyard. Spot them before they get out of control by learning more about what weeds are most prevalent in your region. Naturally, weed issues are highly localised and also depend not only on your kind of garden, but what the surrounding environment is like – some weeds spread via waterways, others by air, and others by wildlife. The following is an introduction to some of the worst offenders in Australian gardens. A truly comprehensive list would contain hundreds of entries. Refer to your local council for more information about local weed alerts. What even is a weed? Weeds are generally plants that aren’t wanted, but turn up anyway. The Australian Government defines weeds as non-native species which, when introduced into the natural environment, are detrimental to our native plants, animals and ecosystems broadly. Many of these plants were first brought to Australia deliberately and some are even still grown in gardens deliberately. It’s when they spread beyond where they’re purposefully sown that they become weeds. Common around most of coastal Australia, lantana grows as a shrub or vine in sprawling thickets that take over native plants as well as pastures and forestry. It even makes bushfires worse and is toxic to livestock. It’s so destructive to local flora and fauna that it’s considered a weed in almost fifty countries. 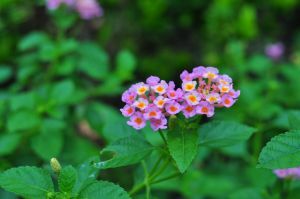 Lantana tends to grow best in disturbed, fertile soil with plenty of sunshine and open space – while it regularly grows in forest edges, it isn’t shade tolerant so doesn’t venture deep into rainforests with heavy canopies. Seeds spread with rainfall but germinate more readily after being digested by animals. People (particularly children) are at risk of toxic reactions to lantana, as well as prickles from the stems. You might have seen some flat rounded cacti out on bushwalks and wondered why there’s a bit of desert in the bush. Prickly Pears are a succulent with cylindrical, club-shaped or compressed stems that were brought into Australia from the Americas to be grown as a commercial crop as well as a decorative plant. Some species are even edible! 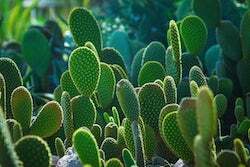 Take care if you’re trying to pick some prickly pears, as their spines can be tricky to remove if they get into your skin. Prickly pears are a pest because they present an injury hazard to humans and animals, and can harbour pest animals such as fruit fly and rabbits. Unsuspecting cows, horses and other livestock who eat up this sneaky weed can get quite ill and experience growth problems. A mostly rural weed, fireweed can be readily found across roadsides, pastures, and open forests near farmland. Luckily the roots are small, so it’s easy to pull up. Fireweed also doesn’t grow too big; in the best growing conditions it can reach up to 50cm height of branches covered in long, wide leaves and up to a hundred little flowers. In dry conditions fireweed can be quite small with narrow leaves, no branching, and few to no flowers. This is the trick to what makes it so pervasive – it’s highly adaptable to adverse conditions. Gorge was introduced as a hedge plant, but as is the case with many introduced species it quickly spread out of control. It now runs rampant across the southern half of Australia where it increases the risk of bushfires and has rendered a lot of grazing land in Tasmania unusable. Gorse is a major agricultural weed as well as a major threat to national parks and bushland. The plant grows in dense thickets covered with tiny yellow flowers, and with each narrow leaf ending in a sharp spine. Its brown-black seeds grow inside grey hairy pods one to two centimetres long. The hard, water-resistant coatings on each pod mean that they can survive dormant in soil for up to thirty years. If you spent much time running around in parks as a kid, you probably know all too well what bindii is. This weed grows prickly burrs which come off and stick to clothes and pets – or to the bottom of your feet! 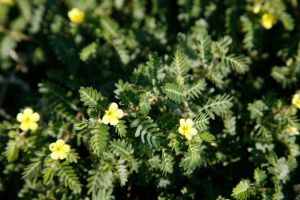 It also grows small bright yellow flowers (each with five petals) amongst its small, fern-like leaves. Bindii is also dangerous to livestock, as another plant that can make them quite ill. It really spurts up during summer across Aussie lawns and pastures as mats made of branching stems. While above ground it tends to grow horizontally rather than vertically, but underground its roots grow deep and secure. To really get rid of bindii, you’ll need to dig out the entire root otherwise it’ll soon be back. One of the prettiest weeds around, their bright cheery yellow flowers distract from their deep stubborn roots that can take a little effort to properly dislodge. It’s important to dig out everything, otherwise it will grow back. Dandelions are a common lawn infestation, not helped by the fact that it’s pretty fun to blow on a round dandelion seed head and watch the little seeds float away. You can spot a dandelion hiding among daisies as they lack an obvious ‘eye’ in the middle of the flower. 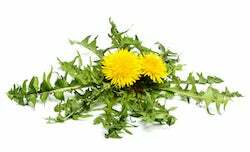 Dandelion leaves are spear shaped, and sometimes toothed. They’re not to be confused with another persistent yellow-flowered weed, the common sowthistle (aka milk thistle). 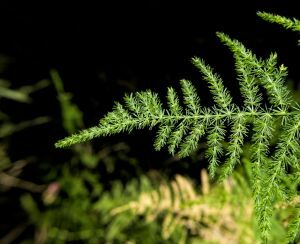 An import gone feral, asparagus fern is still sold as an ornamental plant in some parts of the country. However, it spreads quite aggressively, particularly in urban bushland where it can overpower native vegetation. Asparagus fern develops quite strong and complex root systems in a relatively short time, which is what makes it such a tough weed to tackle. Interestingly, what appear to be leaves are actually small, flattened stems that function in the same way as leaves. The real leaves are just small scales. Asparagus fern grows tiny flowers in spring and summer (ranging in colour from white to pale pink), which develop into glossy red berries by autumn. Clogging up our waterways, salvinia is an aquatic fern which forms thick mats over bodies of water. These mats block light, which severely impacts water quality (particularly oxygen levels) and habitat quality for native plants and animals. Salvinia also blocks water flow, leading to more stagnant water and allowing mosquitos to breed. It can even block boats. Both people and animals have been reported to mistake salvinia for solid ground and fall into waterways after trying to step on it. The plant can survive temperature extremes at both ends of the spectrum and spreads via fragments reaching or flowing along waterways. 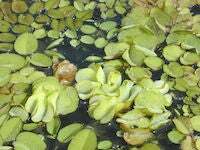 Take care when disposing of removed salvinia, as dumping of the plant is a major driver of its spread. This tussock grass is one of the very worst grassland weeds in Australia. 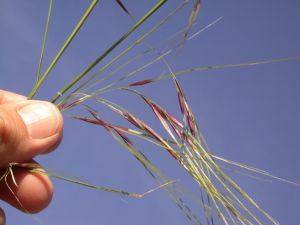 It grows in dense tussocks that can reach over a meter tall, and can produce over 20,000 seeds per square meter – making permanent eradication very difficult. Chilean needle grass is easiest to identify when it’s flowered. The seed heads are loosely branched clusters, like oats, up to 40cm long with a distinctly purple colour. It also produces ‘stem seeds’ in hidden nodes and bases of flowering stems. The leaves are flat, long and narrow, and feel ribbed on the upper surface. Chilean needle grass has a drastic impact on farmland productivity, as it displaces palatable grazing plants. The seeds cause significant skin distress – they have even been known to move through the skin and form abscesses after becoming embedded in livestock fur. Where can I learn more about local weeds? A key element of weed management is prevention – knowing how a particular weed spreads is important to effectively prevent it from ruining your garden or damaging the local environment. Some weeds can be very sneaky about disguising themselves as innocuous plants! 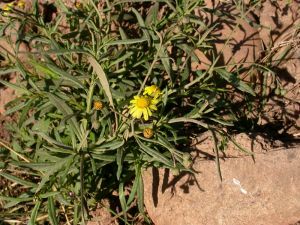 The Australian Department of the Environment and Energy maintains a database of weeds as well as information about how you can manage weeds. Many local councils and bush care groups have online resources about weed issues in your local community.